This self catering accommodation unit has 3 luxury rooms that are spacious and comprise of large bathrooms and fully equipped kitchens. The self catering accommodation rooms are equipped with slim line TVs, desks, single or double beds with space for a 3rd bed. 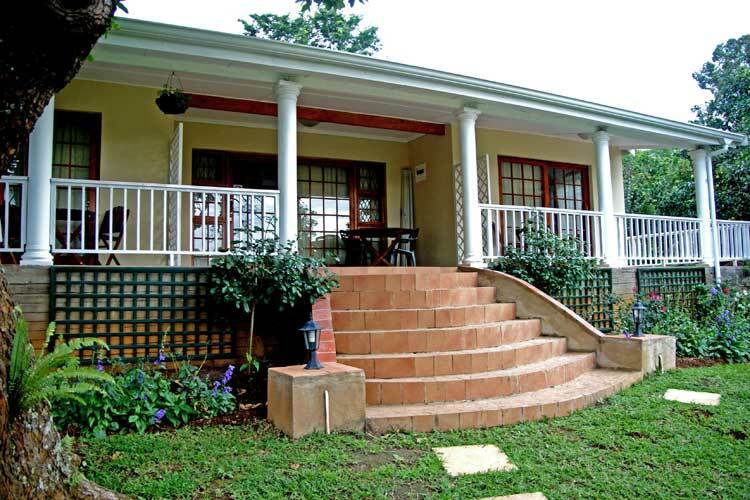 There is a large furnished wrap-around veranda overlooking the garden and the Wembley valley in Pietermaritzburg. Camellia Cottage is a purpose built self catering accommodation cottage comprised of 3 individual separate self catering accommodation units. These three self catering accommodation units have been specifically designed to be spacious, comfortable and fully self contained and ideally suited for our corporate clients. They comprise large bathrooms and fully equipped kitchens: crockery, cutlery, kettles, toasters, microwave ovens, two plate cookers, fridges. The middle unit, room 2 has a bigger bathroom with a shower & bath. Rooms 1 & 2 have queen size double beds and room 3 has two single beds with space for a third single bed. All the self catering accommodation rooms have wall tv’s with DSTV’s, small tables & desks, comfortable chairs and additional outside areas with tables & chairs in a large wrap around veranda overlooking the garden and with lovely views of the Wembley valley in Pietermaritzburg and the Worlds View transmitting tower 4 kms away. Each room is between 200-300% larger than the size of our Standard & Budget Accommodation rooms. The prices we ask for these self catering accommodation rooms is less than 25% more than the prices we ask for our standard rooms so they are by far the best value that we offer.